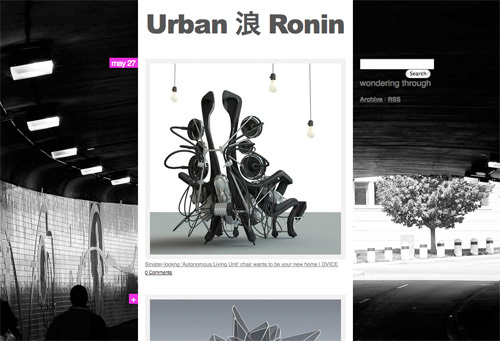 The term “Urban Ronin” is something of a concept of I’ve had for a while. It has evolved over the years. It started out as a story concept, inspired by my two favorite mangas, Vagabond and City Hunter. The story involved a wandering person, a creative type(I never pinpointed what his exact profession would be) wandering through the city, encountering interesting situations. I don’t have the skill to draw a full blown comic book, so that concept simply served as the plot lines of my day dreams in classroom when my mind wandered off. The next version of it was a fashion concept. It seemed more realistic. I imagined it to be a clothing line, inspired by the feudal samurai attires: loose and free-flowing. It’d be something I’d wear myself. I did some research about concept art to prototypes. The cost of hiring a decent seamstress to tailor my sketches to the real thing is rather costly for a hobby. So that was that. I can’t really explain my attachment to the term Urban Ronin. Perhaps it just has a nice ring to it. Or maybe the concept allures me. A modern day ronin roaming aimlessly in the city. His future is unforeseen and dangerous. Maybe it’s just an altered ego I created for myself since it’s the opposite of what my real life is. Due to work and family lately, I haven’t had much time to post longer articles here. I have however been posting random and interesting links on Twitter. Sharing findings is something I enjoy doing since BBS days. However, I find myself spamming Twitter just a bit too much lately with links. So I’ve decided to start a Tumblr blog for that purpose instead. This tumblr blog is set up for quick postings of random thoughts, and interesting findings I encounter on the web. It covers mostly design and art, and sometimes bizzaros. If you’re interested, please check it out. I am very impressed with Tumblr. The setup process was very quick and painless. Its bookmarklet is superb, making posting very easy. I can also post through the iPhone app. Its template system is not as advanced as WordPress’s. But it doesn’t need to be really. I modified an existing minimal theme, there are still some tweaking to do. There’s also a huge Tumblr blogger community. You can “follow” others’ blogs. We’ve been working on a similar concept for the Urban Ronin character. We even run the Urban Ronin Stunt Team here in Miami, Florida. Maybe we can collaborate on these stories?